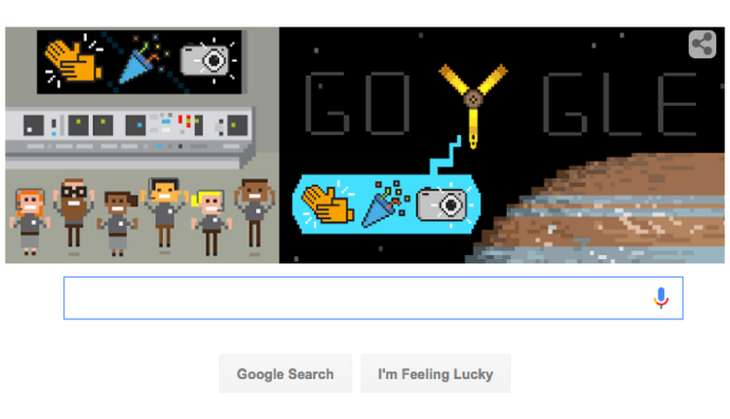 Google dedicated its 5 July doodle to NASA's Juno spacecraft for its successful entry into Jupiter's orbit. The satellite, which left Earth five years ago, fired a rocket engine to slow its approach to the planet and get caught by its gravity. Juno's primary goal is to improve our understanding of Jupiter's formation and evolution. The spacecraft will investigate the planet's origins, interior structure, deep atmosphere and magnetosphere. "You're the best team ever! We just did the hardest thing NASA has ever done," Guardian quoted Scott Bolton, leader of the NASA team behind the successful mission, as saying. However, there aren't many updates about whether the spacecraft has completed its turn and is facing the sun again. Nevertheless, Juno's heartbeat seems to be kicking along quite nicely.